I was riding high, posting reviews of great Karen's Body Beautiful products and then it happened, I tried her conditioning shampoo! I hate when a product has all the right ingredients (check the ingredients below) but it still doesn't work for me. The conditioning shampoo is supposed to moisturize and clean dry or chemically treated hair without stripping the hair. It is true that my hair didn't feel stripped but it certainly didn't feel clean. It almost felt as if it added a layer of crud on my hair. It felt very rubbery but I wanted to condition my hair and let it dry to see if perhaps I was overreacting. Nope, I wasn't overreacting because when my hair was dry it felt and it had absolutely no shine. It was as if the conditioner couldn't get past the layer of residue that the shampoo left. The next day I had to wash my hair again, but that time I used the KBB hair bar. Just as I reported before, the hair bar made my hair feel clean and silky. I would never purchase the KBB conditioning shampoo again.While it didn't work for me, I am curious to know if it worked for any of you. 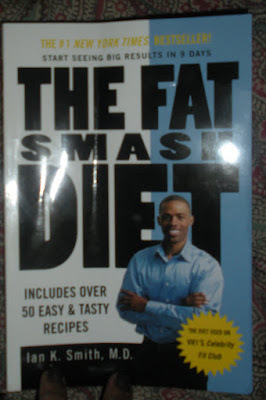 I purchased Dr. Ian Smith's books Fat Smash and 4 Day diet. I purchased the 4 Day diet on Friday because the Fat Smash book was sold out. On Saturday I found the Fat smash at another book store so I will do that 90 day plan first. Today is day two which is still detox. So did you watch The #1 Ladies' Detective Agency featuring Jill Scott? I thought it was done really well. That is a series that I would watch. Is it going to be a series????? When you're done with the fat smash you think you can send it over my way!!! I hope it works well like the lady you posted on. Her before and after was CRAZY!!!! And after Mrs. Young Fashion reads it, send it my way! And after Therapeutic Musings reads it, you can drop it in the mail to me. girl, im doing a 90-day program, too! it's called P90X. have u heard of it? it's 12 DVDs that you alternate in phases. this is the start of week two on phase 1. let me know how fat smash works for you. i may do that when this is all said and done. reading the ingredients on the shampoo bottle, there's nothing in there that even looks like it soaps much less lathers. lol. if it didn't say shampoo, and i didn't read your review, i would think it was a leave-in based on the ingredients alone. i wonder how it works on other people's hair myself. i really love the shampoo but prefer the bodacious beauty bar. Have you tried the herbal shampoo? LOL I see we have a little waiting list going on! Antithesis I have not heard of that system please tell me how it goes. Emeritus bring a pad and pen also because he has a what not to eat list. Amina how did the fat smash work for you? I haven't tried the herbal poo but I love her juicy bar. the diet sounds interesting - keep us posted! Miss yaya I certainly will.